A motorist who fled a traffic stop in the Talmadge area Thursday led police on a 20-minute, two-city pursuit before getting cornered and refusing to exit her SUV, prompting officers to force entry and drag her out for a trip to jail. 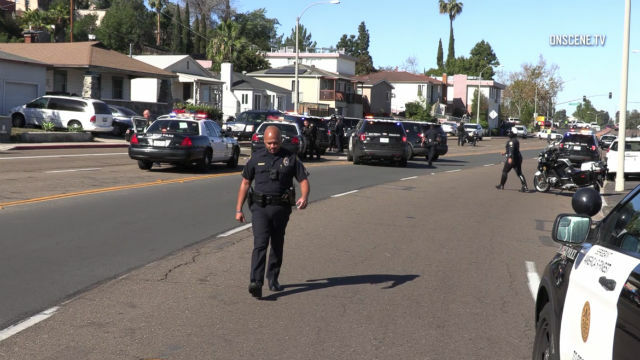 The chase began shortly after 11 a.m., when patrol personnel tried to pull the woman over on 54th Street near El Cajon Boulevard because the black Cadillac Escalade she was driving lacked license plates, according to San Diego police. The motorist, later identified as 57-year-old Diane Daniels, allegedly failed to yield and fled to the east into La Mesa at moderate speeds. At one point, she pulled over briefly at an intersection but drove off again as an officer approached her on foot. At Baltimore Drive and University Avenue, Daniels slowed and made a U- turn, and police used the opportunity to surround her vehicle with their cruisers and block her in on the roadside. Still, Daniels refused to get out of the vehicle and surrender, according to police. After several minutes, an officer broke out the front passenger window on the SUV, and other patrol personnel yanked open the driver’s door, pulled her out, handcuffed her and put her in the back of a patrol car. Daniels was expected to be booked into county jail on suspicion of evading police, reckless driving and driving without a valid license.